Omar Yussef has taught history in Bethlehem for decades. When a favorite former student, a member of the Palestinian Christian minority, is arrested for collaborating with the Israelis in the killing of a Palestinian guerrilla—a transgression with an inevitable death sentence—Omar is sure he has been framed. When Omar begins to suspect the head of the Bethlehem al-Aqsa Martyrs Brigades is the true collaborator, he and his family are threatened, but since no one else will stand up to the violent Martyrs Brigades who hold power over the city, it is up to him to investigate. 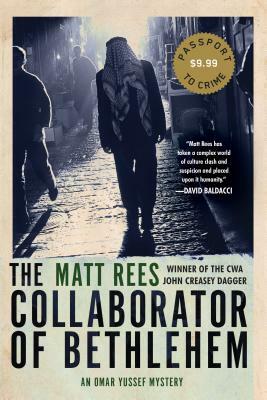 Matt Rees was born in South Wales. He lived for 20 years in Jerusalem, where he was Time magazine bureau chief. He is the author of nine novels, including three others in the Omar Yussef series, and several works of nonfiction translated into 25 languages. He lives in Luxembourg. "All it takes is one good man—a detective, of course—to humanize events that confound understanding . . . An astonishing first novel . . . Setting a mystery in the epicenter of a war zone challenges the genre conventions, but it doesn’t change the rules. In fact, it clarifies the role of the detective as the voice of reason, crying to be heard above the cacophony of gun-barrel politics."